For the first time ever, the 2010-11 winter saw me ‘weathered off’ by a prolonged cold spell in late November and December which as usual brought the UK transport ‘system’ to its knees. Herself and I were booked on a flight on 27 December – when we got to decision point on the 24th it seemed very doubtful that we’d be able to get to our flight (which was very early in the morning) safely and equally doubtful that it would be operating. We decided to postpone and ended up with a completely revised itinerary in the south east of Austria. I’d decided that Austria was going to be the last country for systematic trackbashing so the objective was to clear everything I could in the area, leaving only bits in Lower Austria to do. Inevitably the moles intervened, closing the Jesenice-Villach line at the (in)appropriate time – but there was insufficient daylight for the Arnoldstein-Tarvisio cross border anyway so those two were left for later. The 2011 Eurogricing season commenced with the 07:02 bus to Telford Town Centre! A stroll over to the station was rewarded by the totally unexpected 07:35 LM to New Street worked by a pair of 170s boasting quite a few empty seats. It got us to the Black Hole in time or the 08:30 to Euston but as that was wedged we settled for the 08:50 on which we had reserved seats. Virgin had punished us for our forethought with windowless seats as usual but there were spares so we moved elsewhere. Usual thrash to Euston including the usual exhilarating tilt through Weedon. On time arrival at 10:14, and the Victoria Line to Tottenham Hale narrowly missed 10:37 to Stansted. This provided H with a coffee break so all was not lost. The 10:52 got us to SSD early and in plenty of time for the usual antics (belt and plastic bag police today) followed by Greene King IPA and a 15 minutes late flight to Klagenfurt. We still made the 16:56 bus despite 16:40 arrival, so we were in the Hotel Liebetegger by 17:30. It remained only to potter down to Hirter Botschaft for a weizen (excellent) and the home brewed pils (less so) accompanying assorted heaps of food. Lazy start (due to timetabling and the 09:00 weekday limit on the Einfach-Raus-Ticket) on the 10:06 to St Paul, preceded by adequate breakfast and a pleasant stroll via the Altstadt to the station. 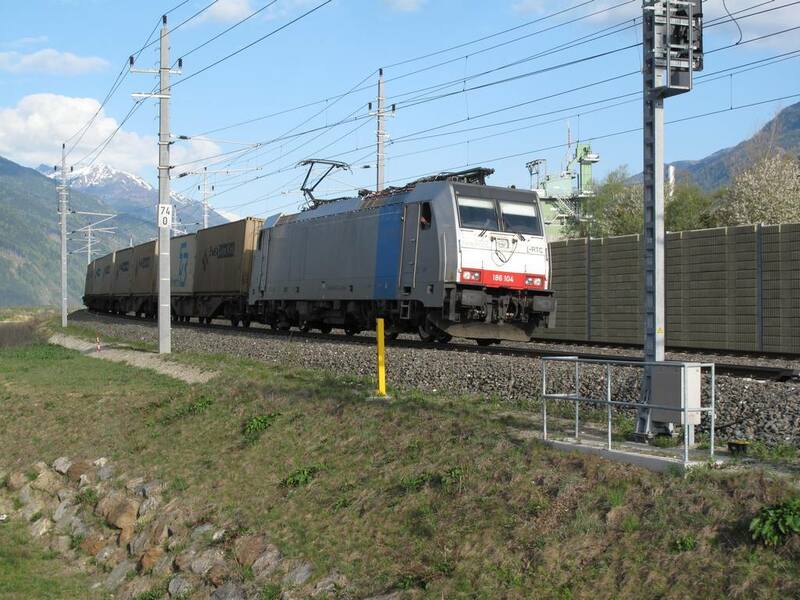 Out to St Paul on 5022 025, observing heavy duty moleworks for the high speed line to Graz. Definitely achieved the physical junction with the Lavamund line as it joins south of St Paul. Overlap with the line to Wolfsberg remains to be checked with the photo from 2008! [The Desperate tour train in 2008 used the middle road and our 5022 was on the westernmost; but the tour was hauled down the Lavamund branch so it mattered not anyway]. At St Paul the pub across the road obliged with a coffee for H and a Stiegl for me before we returned to Klagenfurt on the same kart, making its way back from Wolfsberg. Next up was 14:06 to Rosenbach with 5022 031. A superb branch, well worth the awkwardness of fitting it in. Reasonably well patronised on the outward journey but we were on our own on the return. The preservation operation at Weizelsdorf has two gronks; there was at least one loco in the shed with an old fashioned ‘5’ on it but I couldn’t see what it was. 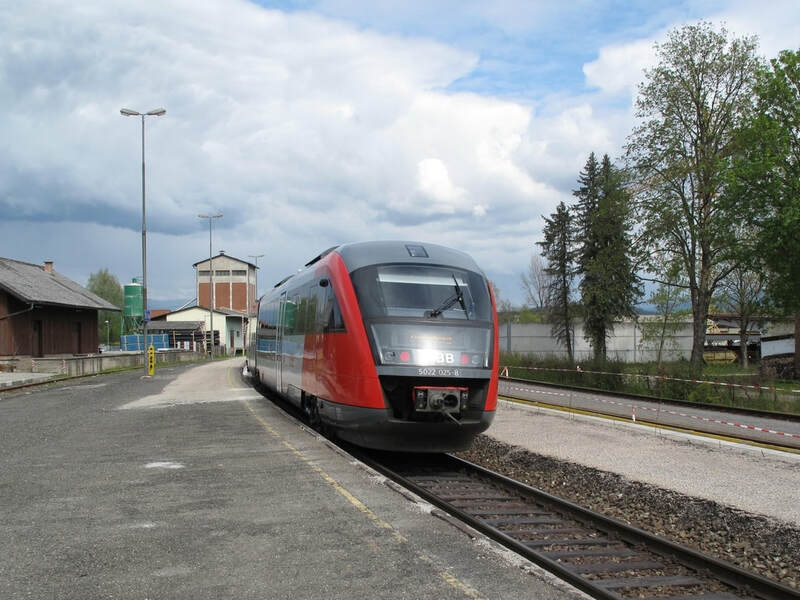 A brief breather at Klagenfurt was followed by a punctual S-Bahn to St Veit a.d. Glan which allowed an easy 5 minute connection on to the (electric) kart to Villach via Feldkirchen. More than 5 in reality as it was held for the ‘big train’ from Wien which ambled in a few minutes late. The south to west curve at St Veit was noted with irritation! Despite the electrification and some evidence of freight, some slow going on the branch suggesting dubious track condition. There’s also a severe slowing over a small bridge near Villach St Ruprecht. Possibly not one to leave for too long. Excellent evening gulasch in a pub off the Hauptplatz at Villach, accompanied by the uninspiring Hirter pils. Thence to the Villacher Braühof, also rather uninspiring and more of a café than a pub. The supposedly unique house beer wasn’t too bad but I wouldn’t rush back. Away to the station in good time for 07:56 to San Candido [cue assorted renditions of ‘last train to San ... oh, never mind] composed of 1216 001 and four City Express coaches. The lady gripper assured us that our Einfach-Raus-Ticket was valid to SC which pleasingly saved €16 for 2x2 cross border tickets. An excellent line it was too, once off the main line – all sunshine and mountains! A very brief sojourn at San Candido then back to Oberdrauburg where a supermarket visit yielded beer and sandwiches. The hoped for bus turned up almost on time (booked 12:46) for an impressive if slightly scary ride over the pass to Kötschach where the fervently hoped for (otherwise we’d be getting to Graz at 00:stupid) connection on to the 13:16 to Villach was made with ease. [It’s all very well looking up European bus timetables at home on t’Internet but when push comes to shove and you’re standing at a deserted bus stop in Lower Ruritania with life’s companion beside you confident in your supposedly all-knowing prediction that transport will miraculously appear to get her to a nice comfortable train/hotel, a slight feeling of insecurity can creep in.] Kart of the moment was 5022 028. For some reason the K-M line seemed less impressive but I suspect only because it wasn’t sunny! Ottakringer from the shop at Oberdrauburg helped the journey along and supplies were hastily replenished at Villach thanks to an on time arrival. There followed a fairly tiresome ‘S-Bahn’ hike to Freisach and another one to Bruck an der Mur – but wait – it went via St Michael [as booked, I’d just been too ignorant to realise] thus doing the south to west curve on to the Selzthal line, which I needed. 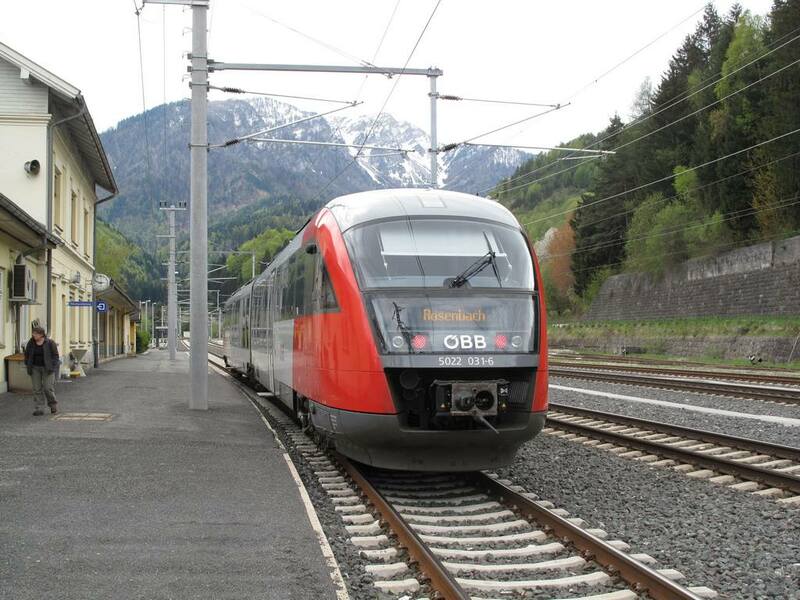 It reversed there of course, and back to Leoben via the new tunnel, leading to an urgent text to a friend to enquire if the old line has a booked passenger service. Sadly it seems not. On time again at Bruck a.d. Mur, to find that the 19:09 S1 to Graz was the first train in two full days to be late. Only by four minutes though and we were at Graz Hbf by 20:00 and in the Ibis a couple of minutes later. Supper was taken at Glöcklbräu, the Puntigamer showpiece. The house beer, allegedly from oak casks, etc., etc., was on an equivalent level of insipidity to the Villacher one but mercifully cheaper. The food would have been OK hot ... much nicer pub than the Villacher one but as in that case, I wouldn’t rush back. ... and the second, with rentalok 186 104. 5022 028 awaiting departure from Kötschach-Mauthen - I even had time for a photograph. After a brief sojourn at Szentgotthard, back to Fehring on the 5022 for a break of almost 2 hours. More exploration by your correspondents unearthed a pizza place near the end of the station drive. This sold the excellent Murauer and also food at (by local standards) modest prices, so there seemed little point in plodding the mile or so to Fehring town on a warm day. Back at the station, 5022 004 reappeared from Gleisdorf in time to form 13:27 to Wiener Neustadt which hopefully will provide us with the connection to Oberwart. As indeed it did, with not a huge amount to spare. 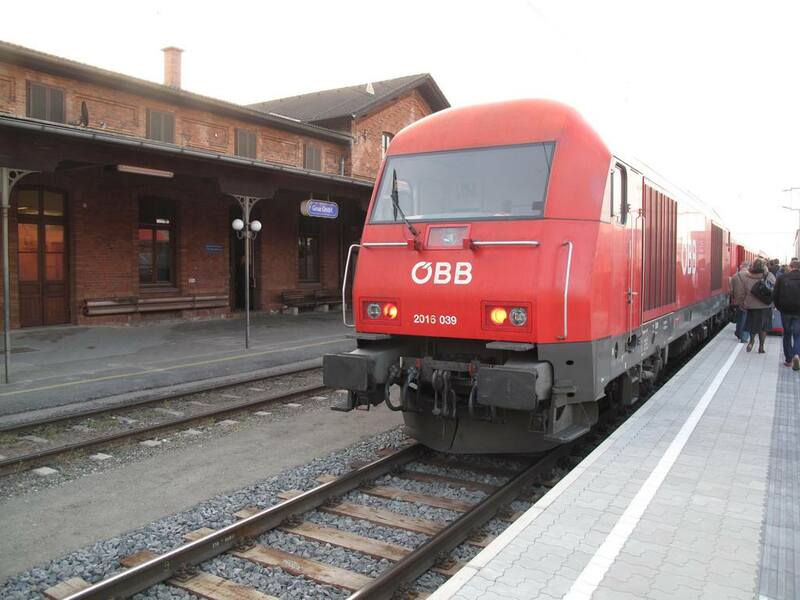 5022 037 to Oberwart, from P2 (? Centre road anyway) at Friedberg. A brief Stiegl and ice cream stop occupied us at Oberwart until the return to Friedberg at 16:23, for the 17:02 thence to Gleisdorf worked by 5022 004 yet again, it having been to Wiener Neustadt and come back still without water for hand washing. It had been like this all day, which left us unimpressed. Bus again from Gleisdorf, for a punctual arrival at Graz Hbf and another SEV (substituting for a tram this time) to Jakominiplatz. A short walk then to Gösser Bräu for food and somebody’s Schnee Weisse (excellent) and Gösser Märzen (surprisingly seems better in a can). A speculative early venture after the firm assurance by the Graz Hbf Reisezentrum that there were no trains from Graz Ost to Hbf, only SEVs. The temporary timetable said otherwise, and we were rewarded for our trust by 2016 039 on 4 City Express coaches forming 07:03 Graz Ost-Graz Hbf. The Big Daft Grin was duly deployed. Breakfast was taken at Hbf, just as poor as the Ibis but half the price, followed by a return to the Ibis to collect the gear and pay the bill. 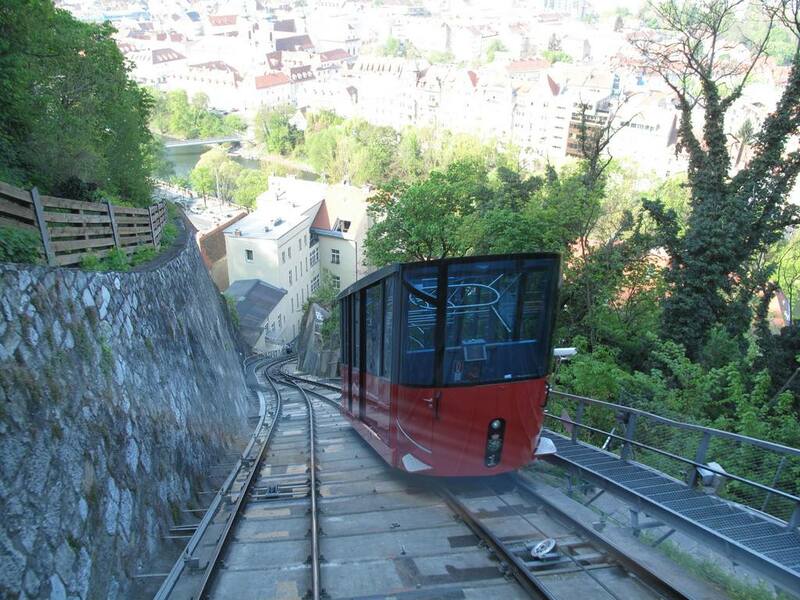 Thence by bus and tram to do the Schlossbergbahn funicular (Graz 24 hour ticket being worked hard as it covered all this and the 07:03 train as well). More time at the top would have been good on such a nice day but we had to go back down and make our way to the station (SEV again) for 10:08 S-Bahn to Spielfeld Straß, worked by a hot 5022 048. 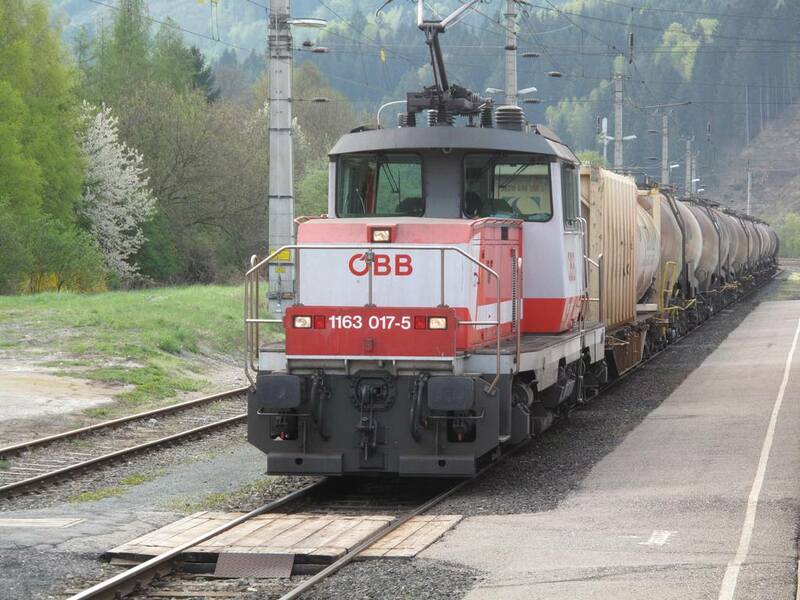 At S/Straß it turned out that 048 was also doing the Bad Radkeburg turn (if I’d read the Hafas platform numbers I’d have realised this) which ensured doing the physical connection, always welcome. 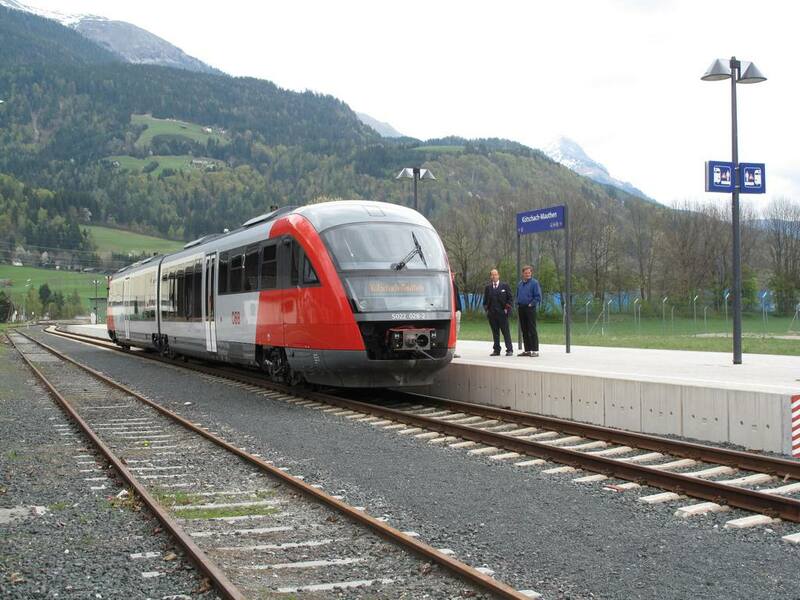 A very unexciting branch by Austrian standards but it did bring the trip to a 100% successful end in track terms. A rare defeat for Max Maulwurf but I’m sure the little chap will bounce back. Returning to Spielfeld Straß we found the 12:39 Graz still there, headed by 1142 568 and with 2016 079 in the process of being attached. 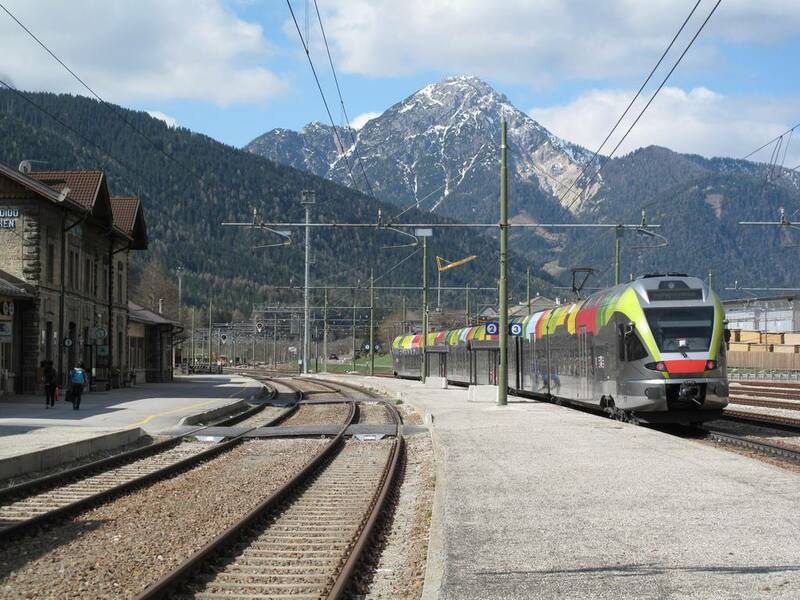 We assumed the 1142 had failed but in fact the 2016 was detached at one of the intermediate stations en route Graz, seemingly to rescue a southbound 1142 which really had failed. Our 1405 onward connection from Graz (which had been our intended connection from S/S) was late too, but not enough to miss the connection at Bruck an der Mur. There remained only the trudge back to Klagenfurt, reversing at St Michael again and changing at Friesach (a pointless manœuvre presumably down to local Steiermark/Kärnten politics). Eventual arrival at Klagenfurt was on time at 17:46. Evening refreshments were taken at the excellent Zum Augustin in Pfarrhofgasse where the brown ale-ish ‘house beer (really?) was declared much better than the Weihenstephan weizen. This last does seem to be suffering from becoming a mass market beer. Graz Ost, reached this time from Graz Hbf thus filling in a particularly irritating gap, and with a diesel loco (2016 039) too. 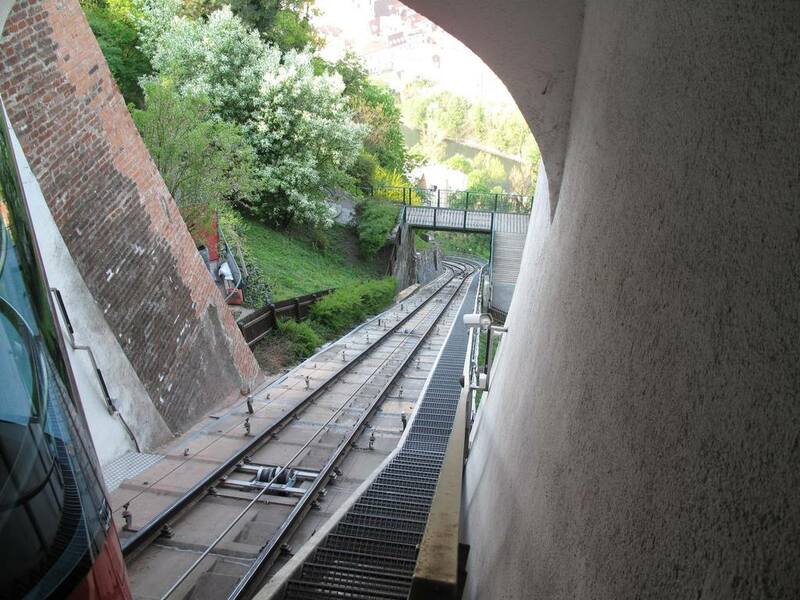 The view from the front of the 'downhill' car at the passing loop on the Schlossbergbahn funicular. Nothing of Eurogricing interest today. A pleasant morning’s sightseeing including a bus ride out to the Wörthersee, then bus again to the airport. Mr O’Leary’s aeroplane got us back to Stansted in sufficient time for H to suffer the fanfare for the first time, and NXEA, LUL, VT, ATW and Arriva Midlands all worked well together to get us back home to darkest Shropshire by 22:30. This very satisfactory expedition leaves me with a fairly small amount of Austrian track (as defined by standard gauge lines having regular ÖBB/GySEV passenger services) to do. Having decided to take a stand and declare this the last country to be rigorously trackbashed, I’m anticipating only one further major Eurobash, this being a global Interrail to finish off Austrian track plus some German and Czech reopenings. Never say never of course, but that’s the current plan.The intervention of the Mole is always a possibility however, (I’m writing this three weeks before departure) so I’m still saving Air Miles for all I’m worth in case a quick trip to Wien is required to clear up any loose ends. Two months later I set off, clutching my Global Interrail, for a Lufthansa flight to Germany. My plan started and ended in München, taking in 6 other countries on the way.